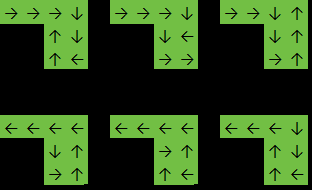 The function must return the number of possible paths the snake traveled. Note that the question just ask for the number of Hamiltonian path in the graph. Add an vertex (called True) that is connected to all other vertices. Count the number of Hamiltonian cycle on the resulting graph. The graph is constructed using MakeGraph (annoyingly there are no directly equivalent built-in), using the boolean function ##||Norm[#-#2]==1&, which returns True if and only if one of the arguments is True or the distance between the two vertices are 1. Tr[1^x] cannot be used instead of Length@x, and <2 cannot be used instead of ==1. Starting from each possible cell, we flood-fill the matrix, clearing all cells on our way. Whenever the matrix contains no more 1's, we increment the number n of possible paths. Each valid path is counted 4 times because of the direction chosen on the last cell, which actually doesn't matter. Therefore, the final result is n / 4. Despite the rather long formula y=1/y?y:Y which is needed to set the initial value of y, this saves 2 bytes overall. ŒṪ               Positions of snake blocks. blocks. Each one is at least 1. ÐṂL      Count the number of minimum values. the minimum value is [1,1,1,...,1]. Not the answer you're looking for? Browse other questions tagged code-golf grid binary-matrix or ask your own question.